We all strive to look younger than what our actual age. But in order to get a younger looking skin, you need to start using the right products from a young age. Mirah Belle Pomegranate Seed Anti Ageing Face Oil is one of those products that will keep you young always! 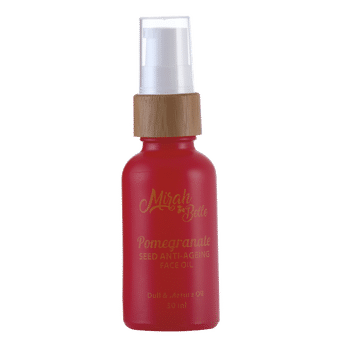 Enriched with the multiple benefits of pomegranate seed oil, argan oil and sunflower oil, this elixir will keep your skin free of wrinkles, blemishes and age spots and leave it looking youthful and radiant. Loaded with anti-ageing, antioxidant and anti-inflammatory properties, this oil fights free radicals and keeps skin problems at bay. It will improve the skin elasticity, prevents sagging and makes the skin firmer. Argan oil has emollient properties which will make your skin soft, supple and smooth. It also has sun protecting benefits. About the Brand: Mirah Belle Naturals is dedicated to creating the best quality, healthy and effective skin and hair care products that are free from synthetic chemicals and are 100 percent organic. The brand manufactures high quality handmade soaps, skin and hair care products using only natural ingredients, free from artificial ingredients and harmful chemicals. The products manufactured at Mirah Belle Naturals have natural nourishing ingredients that are packed with protein, vitamins and minerals and are enriched with the goodness of essential oils, botanicals and natural additives (such as clays and salt) and skin nourishing butters.